Reproducible story and application pictures for all the Bible stories children love - together in one place! These pictures help children learn age-appropriate lessons and keep them focussed on God's Word with a special section of Bible memory pages. Ideas for using colouring pages as creative teaching tools, and much more! THRU-THE-BIBLE COLOURING PAGES helps you reinforce Bible teaching, strengthen life application, and encourage children to memorise Scripture at an early age. 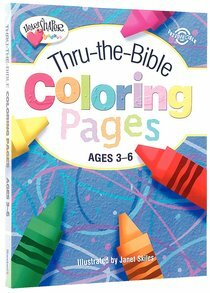 About "Thru-The-Bible Coloring Pages (Ages 3-6) (Heartshaper Series)"
Reproducible pages for preschoolers to color, covering major Bible stories in both Old and New Testaments. Reproducible pages for preschoolers to color, convering major Bible stories in both Old and New Testaments. Newly updated! Kids will learn and apply Bible stories as they color pictures from both the Old and New Testaments. Reproducible. More than 125 age appropriate crosswords, mazes and other games designed to make learning God's Word fun! REPRODUCIBLE. For ages 6-8. 144 pages. More than 100 Old and New Testament puzzles plus more than 20 puzzles based on important Bible verses help kids interact with their favourite Bible stories in engaging ways. BIBLE PUZZLES FOR KIDS offers a variety of Bible-based puzzles that are reproducible and created to challenge and help your students as they enjoy learning God's Word. * Puzzles based on picture codes* Word searches * Mazes * Crosswords * Scrambled word puzzles and more! Each puzzle has been created by a team of experienced puzzle writers and developed to correlate to HEARTSHAPER children's curriculum. Use BIBLE PUZZLES FOR KIDS to reinforce Bible story teaching, provide optional enrichment activities or to encourage your students to learn at home.